Sunday, September 9, 2018 5:00 p.m.
Douglas Katz of fire food & drink, Provenance, and the Katz Club Diner. cured meats and local aged cheeses, house pickled vegetables, sliced and freshly baked country baguette, whipped grass-fed butter and foraged berries; morning baby lettuces with fall turnips, beets, carrots and maple glazed bacon with cider vinegar-thyme dressing; grass-fed beef, local mushroom and barley soup with parsley and chives; Rittman Orchards ida red apple crisp with custard sauce. 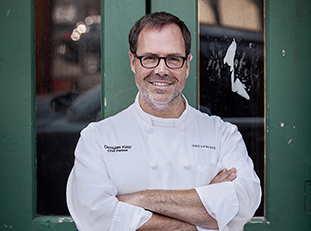 Douglas Katz is the owner and executive chef of fire food & drink at historic Shaker Square, owner of The Katz Club Diner in Cleveland Heights, and Chef/Partner of Provenance at the Cleveland Museum of Art. Chef Katz recently launched the Fire Spice Company in late 2015.